You have the artist, Pete Johnson, the foremost boogie woogie piano player of the past decade who became a first call sessionist for a wide array of singers, who is now once again seeking to make headway with releases under his own name by offering a slightly new variant of his classic work in another – newer – field of music. You also have an independent record label in Down Beat whose roster of artists is fairly impressive but very small in number and thus are looking pad their release schedule. In doing so they’re hoping perhaps to find a receptive audience with rock audiences, yet knowing that with Johnson they also have a chance to pull in their own core audience of blues and jazz listeners who are at least familiar with his name and reputation. Lastly there’s those of us seven decades in the future, looking back in hopes of finding a hidden gem or two from a legendary figure who had very few releases under his own name in the rock era yet who was such a vital figure in presaging the style and as a sideman early in its rise before fading ignominiously out of sight. Probably needless to say the opportunity doesn’t pay off in this instance for any of us, Johnson, Down Beat Records or crate diggers in search of something memorable, but that doesn’t mean it can’t be hauled out of mothballs to give it the once over in an attempt to find out what they were all thinking along the way. When reviewing the top side of this, Skid Row Boogie, a good record that doesn’t aspire to be more than that, one point we raised as to how it might’ve been improved was by possibly adding a third soloing instrument, namely a guitar. But since guitars were still not a common feature in rock music in the late 1940’s the likelihood of that happening seemed too slim to really consider an obvious choice to criticize them for and so we gave the arrangement, which otherwise was very solid, a passing grade without any reservations. Yet here on the B-side they not only surprise us with a notable change in their approach but in the process show that maybe we shouldn’t have cut them quite as much slack as we did in that regard. The reason is the very first sound you hear on Half Tight Boogie is that of… a guitar! Okay… rather than re-hash the debate over yesterday’s record let’s focus instead on THIS record and see if the addition of a guitar can improve upon that model and take this to the next level. We need to start with the fact regardless of the new wrinkle they’ve added there’s still the long-standing issue of how to make piano-based instrumentals interesting enough to compete with everything else out there without reducing the piano to merely a secondary role in the process. The more you think about it though the more you see how difficult this problem has ALWAYS been to tackle when it comes to figuring out how to showcase the instrument best in rock ‘n’ roll, especially when devoid of vocals and lyrics to off-set its presence. Though the piano was a vital component of rock from the very beginning its role over the years certainly has diminished quite a bit after the first decade and a half but it got off to a pretty good start and even today maintains a well-earned legacy for excitement courtesy of Fats Domino, Professor Longhair, Little Richard and Jerry Lee Lewis on down. But in spite of the monumental work of those legends and others to follow there have been startlingly few classic rock instrumentals that have had a piano as its centerpiece. Keyboards, yes, the organ has been especially well suited for instrumentals in all types of rock, from soul to avant garde styles, but the acoustic piano, not so much. There’ve been some of course, but the heyday for the piano instrumental was already in the rear view mirror by the time rock came into being in 1947. It had become so tied in the public’s mind to the boogie woogie craze of the previous ten years that perhaps in order to establish itself as something unrelated rock had no choice but to jettison it as a soloing feature. How fitting then that it’s the leader of the boogie woogie movement, Pete Johnson, who gets to see if he can take it from that setting to this one and re-craft it in such a way that it appeals to a new audience without losing any of the excitement along the way. The key component for success in all instrumentals remains the same – finding a hook that seems at once instantly familiar yet will hold up over repeated plays without losing any of its allure. Yet for some reason the piano historically has been ill-suited for such an endeavor. We touched on the possible causes of this in the last review stemming from the inflexibility of the instrument, but of course on Half Tight Boogie Johnson is not alone. A saxophone – played by the great Maxwell Davis no less – and now a guitar thrown in the mix offer very distinct alternatives to the dominant sound of the piano. One can easily envision – on paper anyway – letting the sax and guitar play with the melody and then let Johnson emphasize the rhythmic accents in the middle eight before the others return to get you back to the hook. Or perhaps let Johnson lead it off with a pounding intro that gives way to the guitar and sax who take it even further into the stratosphere. Maybe they can even trade off throughout it as future piano pounders did. After all Domino and Little Richard both let Lee Allen’s sax have plenty of room to breathe on their hits, while Lewis typically yielded to Roland Janes flashy guitar in between The Killer’s two ivory smashing solos. So the potential here for delivering something that at the very least succeeds in those basic aims is substantial. Despite lacking the guitar on Skid Row Boogie they’d managed to come up with a very tight arrangement, one that traded off between piano and sax well enough, so the outlook for this became even brighter when you add the guitar. Except as soon as Half Tight Boogie begins you get a curious look on your face because this isn’t an electric guitar at all, but rather an acoustic, which utterly changes the entire feel of the song. Suddenly instead of appearing forward looking it’s leaning backwards and not even towards the style that Johnson himself was most at home in, but rather harkening back to a country blues motif. The first three seconds you hesitate on rushing to judgment, but the next three seconds just confirm your skepticism. You can shut it off right there, six seconds in, before Johnson’s fingers even touch the keyboard, and proclaim your decision is final. No need to hear another note played for no matter WHAT they do next they’ve already let the opportunity for potential greatness slip from their grasp. This is no bold leap into tomorrow, but a step back into the past. We of course can’t do that – turn it off I mean – we have to see this through to the end and truthfully we should WANT to hear where they take it from there and if they stick to that anachronistic mood the acoustic guitar laid down or if they jarringly head into a different direction once the other instruments join in. Certainly the tenor sax is not an instrument usually found in country blues songs so something’s gotta give in the presentation. It’s probably no surprise that it’s the very thing they just introduced – the guitar – which disappears from view as Johnson takes this out of the rural environs it began in and places it in the citified clubs of his own past. A little more modern and upscale than the backwoods guitarist has ever encountered, but still something sitting just behind the times for 1949’s rock audience. When he gives way to Davis’s sax it takes another left turn and gets closer to our current perspective, both in terms of era and setting, yet even here Davis isn’t really cutting loose with his playing. It’s a moderately smoky feel he’s offering, but slightly too laid back for our tastes. His playing is the sound of a mid-evening stint on the bandstand at a classier joint, albeit not one that is too restrictive and caters to those above our status as rock fans, but it’s still something that is designed simply to pass the time until the real show kicks in around midnight when everybody loses their inhibitions and starts to really get down. At this point it’s almost shaping up to be representative of the path black America itself was taking over the past two decades from the rural south of the 1930’s to the mid-western towns at the turn of the decade to the promise of the west coast cities after the war, improving their standing in the world each stop along the way. Call it a time travelogue if you will, but it’s doubtful that was its intent. Sure enough when Davis steps aside this is confirmed when Herman Mitchell’s acoustic guitar returns for an unwelcome second act. It’s not played badly by any means, but it’s just completely out of step with the parts we’ve come here to expect and have laid our money down to hear. The abrupt jumps from one sound to another are too disconcerting to appreciate each instrument for its own qualities. If you think the saxophone has the right idea with its playing then hearing the guitar refute that is not only going to cut your enjoyment short, but will actually lower your perception of the lines Davis just blew preceding it. On the other hand if you happen to get a kick out of hearing a throwback sound like the acoustic guitar then surely being dragged a dozen years into the future when the saxophone makes its appearance it’s going to break that spell pretty quickly. Then there’s the piece largely missing from this critique who supposedly was the focus of the record, namely Pete Johnson. After his early featured spot he recedes to the background to the point where you almost forget he was even involved in this. When he finally makes a reappearance two minutes in he’s competing with a repeating massed horn riff and it’s not until nearing the end where he even gets a chance to step out front by which time you’ve lost all interest. Talk about a misleading proposition. Not only is the song completely undeserving of a title like Half Tight Boogie but the musicians with the reputations you were anxious to hear from are reduced to supporting characters and when they do take their featured spots it’s with absolutely no sense of urgency. It’s almost as if they were merely halfheartedly messing around before the real show began later that night. What makes all of this such a let down is the sense that this was a missed opportunity. If you wanted to try an appeal to a pure blues audience by adding the acoustic guitar then this sure wasn’t the way to do it. A tenor and alto saxophone are completely out of place in that style and even Johnson’s piano doesn’t quite fit, though at least he could’ve altered his approach to something a little more suitable, maybe something along the lines of a Leroy Carr where he was playing fills behind the guitar rather than taking the entire structure of the song off in another direction. But since this was Pete Johnson’s shot at glory HE was the one who needed to be given the means with which to connect and if that meant booting half the band to the sidewalk and replacing them with those more suited for his goals then that’s what they should’ve done. 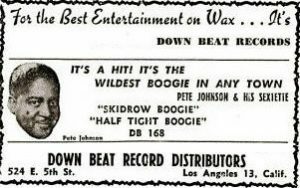 At the risk of merely repeating myself the solutions presented on Skid Row Boogie, which absolutely shines in comparison to this, still stand… if anything it only reinforces them. Get a guitar that plugs in for one thing, let him play some sharp sounding boogie riffs of his own. Once he’s set your hair on end let Johnson storm to center stage pounding up a storm – same riff even, but with a ferocity that commands your attention, something he was more than capable of doing. Then have Davis come in, starting off slow to downshift into something more melodic before having him take it up a notch and honk up a storm. By the end all three can be trading off or playing in unison or even hitting one another over the head with their instruments if you want. It might not of worked, it could’ve regressed into anarchy or simply been too much of a good thing, yet it’d have the potential to get you moving so much that you wouldn’t notice when it came crashing to a heap by the final refrains. If nothing else at least the energy and excitement would be palpable and would show that you went for the jugular on the song, trying for something that might’ve exceeded your grasp but certainly not selling yourself and your artist short. Instead on the Half Tight Boogie they DO serve up you’re left sitting in the same spot you started in with a half glazed, half bewildered look on your face wondering why they bothered rolling the tapes for this in the first place. Leave a reply on "Pete Johnson: “Half Tight Boogie”"